The beauty of the human body, a harmonious physique and physical vigor are the key subjects of Valery Katsuba’s photographs displayed in the Sputnik Gallery, New York. Before becoming a photographer, Valery Katsuba tried his hand at many fields: he sailed, worked as a radio and newspaper journalist, hosted a television show, then produced photo shoots for magazines and, little by little, started taking photographs himself. The Hasselblad camera he received as a gift from photographer Neil Kirk served as the main impetus to his new passion. Being talented in many ways, Katsuba did not turn photography into his only hobby but this in no way diminishes the value of his works. The exhibition "Air Flight. 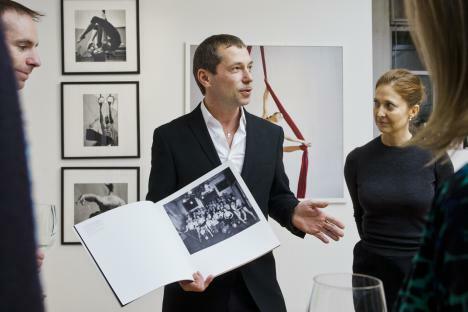 Body Shock" by St. Petersburg photographer Valery Katsuba in New York's Sputnik Galery is more than just an exhibition dedicated to the aerialists and acrobats of the Moscow Circus School. It falls within the genre of "art about art" and reaches what Wagner considered a peak of creativity - a synthesis of art. Black and white classic photography, video with music composed by Simone Spagnolo, and large- scale color photographs create a marvelous show, a space that glitters with many meanings, lures the viewer and creates within him empathy. This is not the first time the photographer has taken sports as his subject-matter. In 2007, his Phiscultura album was released by Spanish Turner Publishing. The first part contains archive photos, while the second includes Katsuba’s own pictures inspired by Soviet sports photographs. In this project, the artist manages to depict the enthusiasm for various sports in Russia over the last hundred years. In his new "Air Flight. Body Shock" project the author when choosing circus performers as his topic - not a very fashionable topic in contemporary photography - did so expressing his own feelings without irony or distance. "Circus aerialists and acrobats, they are favorites from my youth. In a sense, to me, this project is a dream come true. I aspire to go there, where everything is light, beautiful and clear." The human dream to fly likely does not derive from bird watching, but evolves from the experience in our dreams, as well as from the well- known internal freefall. Flying is an unconscious desire, explored even by Da Vinci and Freud and is enclosed in the evolution of the memories of our body and brain as a potential opportunity. Valery Katsuba structured his project so that it emphasizes the sublime and classical nature of the trapeze artists and acrobats. This additional element turns the gym into great art. In these works, the emphasis is not on the trick - the foundation of the traditional circus - but rather on, one might say, the aerial ballet. These works are a hymn to the beauty and power of the human body. The director of the Sputnik gallery, Amy Kouznetsova, shared an interesting background story in connection with one of the private viewings for this exhibition. Jennifer Place, an elite and winning triathlete and owner of Fifth Gear Triathlon Coaching in New York, reached out to Amy to arrange a private viewing of Valery's work for her athletes. As the athletes and Valery got to know each other, it quickly became a true exchange of art and athleticism. The athletes changed clothes (or, in some cases, removed them) and invited Valery to do some conditioning exercises with him. In turn, Valery turned the spotlight on them by incorporating them into his art. "The aerialists and acrobats Valery photographed for his "Air Flight. Body Shock" project are themselves in the business of exhibiting their form and their skill and to amaze people. We, the public, are amazed when we see forms like that and especially when they do tricks in the circus. But the athletes who came that night are actually also completing feats that most ordinary people find amazing and have forms that - even though not exactly the same as those of gymnasts - are every bit as perfect." - Amy Kouznetsova told.- "For me, this evening made me realize that the perfection found in art (and not often found in everyday reality) can in fact be found very close, and we were able to adore the real achievement of people we know." The exhibition is open till January 19, 2012. The trampoline gymnasts perform, carrying out the dynamics of unexpected angles of a fluid body. Source: MrVkatsuba.